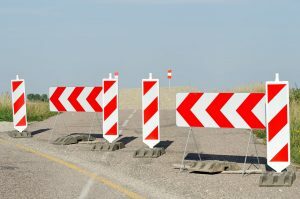 Communication is challenging when people resist, criticise or require data to back up your claims. Proven tools to influence others. 5 mins a day for 30 days to develop your communication. Option to unlock app and fast-track your learning. 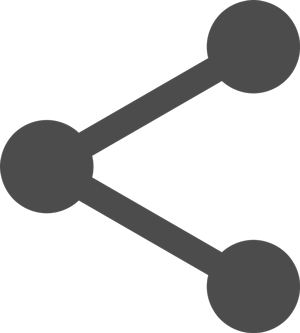 Back-up conversations with more information by sharing resources. Articles, videos, books and inspiration easily shared on social media, email or text. Training accelerates your ability to convey complex issues and handle strong emotions. Each day focuses on a communication challenge and solution. 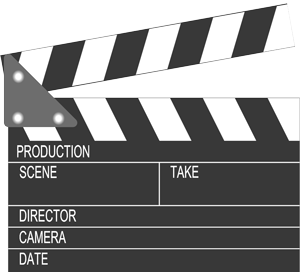 Read the outline, digest video and add Tip of the Day to your communication toolbox. Have resources that’ve helped communicate veganism? Share with others by loading into Resources Section. So if you are frustrated that you can’t easily say what you think or feel about veganism, here’s the solution. Vegan Voices will make communication your strength, so even the most difficult conversations become a breeze. After downloading the app, you can watch Day 1 of the Training and access the Resources Section. Then, 24 hours after you begin, Day 2 will unlock and so on until you have completed all 30 days. If you wish to consume the material quicker, you can unlock the app in one go for a small cost via an in-app purchase. After watching a video on a particular topic and practising the skills shown, you are ready to speak to anyone about the topic. To back up your discussion, visit the Resources Section to find suitable material to easily forward by email, text or on social media. You can suggest any other resources for other vegans to use in their conversations. How Do You Stay Motivated and Confident Talking to Non Vegans? Do you know of a website, video, book or other resources that might help others vegans communicate better? Submit the details in the box and as long as it’s appropriate and in line with the 5 International Freedoms for Animals, we’ll add it into the resource section of the Vegan Voices app. Is Vegan Voices Available on Android or IOS? Vegan Voices is currently available for IOS (iPhone or iPad) and Android devices. How long is each video and will it take me hours to learn the skills and apply them? Each video contains proven tools and language to improve your ability to talk about veganism. You are encouraged to watch a video and read the short overview before each video. Then read the TIP that outlines the actual generalizable skill to the specific issue discussed or ones similar. The more you practice and apply the skills, the sooner you will become more comfortable talking about all aspects of veganism and be a proficient Vegan Voice. It’s a very big app and it’s too big to download on my phone. What do I do? The Apple store restricts larger apps (over 100Mb) to download over a Wifi connection only. Connect you phone to a Wifi connection and then download app from the App Store. Is this for new vegans or those who have been vegan for some time? The training can be used by new vegans who have little experience of talking to other people about veganism or those who have been vegan for a long time. The longer you are a vegan, the more time you will have to acquire information and resources to have conversations more easily. However, the majority of vegans find it enormously difficult to calmly communicate veganism when they are feeling emotional about the content or when other people ridicule, criticise or undermine the vegan. Thus, acquiring some proven skills to have difficult conversations across multiple situations is valuable for vegans, wherever they are on the journey. Is it just Clare Mann speaking on the video training or are other people speaking? Are there resources I could send to other people to back up my arguments? There is a Resources Section of Vegan Voices which contains supporting material that can be easily forwarded to someone to supplement what you have communicated to them. Go to the Resources Section, choose a relevant topic from the list and scroll through the links, articles, books and other supporting material to send to people to educate them further. These materials come under the following topics: Animal Social Justice, Health and Lifestyle, Environment, Self-Care and Celebrating Animals. How can I decide what is relevant to send as a resource to someone? I don’t want to traumatise someone with sending animal cruelty videos when they have only asked a simple question? Each resource is given a rating in terms of how challenging the material is considered to be. This ranges from a Tickle to a Sledgehammer. For example, a tickle rating would provide information to inform someone without the information being highly traumatic. A sledgehammer rating would indicate that the material is very challenging e.g. a link with graphic imagery of cruelty. You can choose what to send someone to support your argument, remembering that your intention should not be to traumatise someone but to get them to change their behaviour or lifestyle choices. Note that when you use the share buttons in the app it will share the original source material – not the vegan voices web site or app link. Could I add my own resources because I come across great ideas that communicate veganism and I think people would really benefit from this? 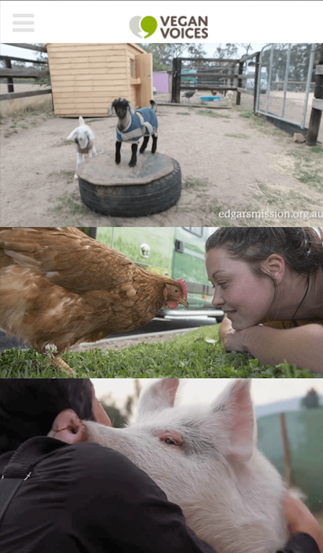 Vegans share with their friend’s videos, articles, books and films that have proved successful in communicating the vegan message. You are invited to submit a link to any resources you have that have found valuable in educating non-vegans so that other people can use them too. You will find a submission form in the Resources Section (and also on this website) where you can easily contribute your suggestions, together with links. All resources are vetted by the Vegan Voices team to ensure they are suitable and to ascertain their rating. Can I get Vegan Voices in my country? Yes. It is available in every Apple store (Over 150 stores). We are looking to release Vegan Voices in different languages in due course. Do you see people face to face or run training courses outside of the app? Clare Mann, co-creator of Vegan Voices sees vegan clients in person for 1:1 session in Sydney Australia and also via Skype or FaceTime. You can contact her via http://veganpsychologist.com. Are there videos on there that will upset me? No, Clare Mann features in each of the thirty training videos providing and demonstrating the use of powerful communication techniques to help you communicate veganism. There links to videos in the Resources Sections that contain graphic imagery and before opening them you will be advised that their rating is the Sledgehammer. You can also read the description which will indicate what it contains and whether you wish to access that material. The intention of Vegan Voices Resources is not to upset people but provide vegans with the materials to support them in being the best voice for veganism. Is it possible to unlock the entire suite of videos in one go? 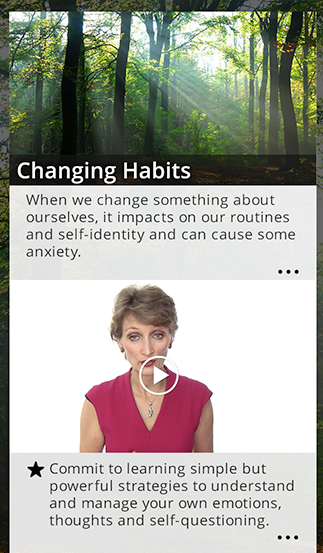 Upon downloading the app, the user can watch Day 1 of the Training and access the resources section. 24 hours after your first download, Day 2 will unlock and so on until you have completed all 30 days. Once a day has been unlocked, you will be able to access all previous videos. If you do not unlock a video each day, you will receive a notification reminding you that the new video is available. If you wish to consume the material quicker or access videos in the order of your choice, you can unlock the app in one go for a small cost via an in-app purchase. 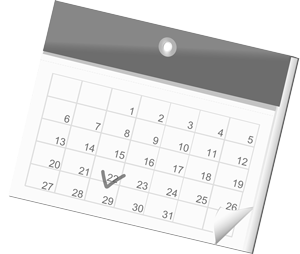 What happens at the end of the 30 days of video training? At the end of the 30 days training (or when you have unlocked all videos by paying a small fee), you can return to any of the 30 videos at your leisure. Because it’s often challenging to discuss veganism with non-vegans, you are encouraged to regularly refresh your skills by re-watching videos as required. Only with practice will your skills improve and you find it easier discussing issues where people resist, criticise or deny the content of the material. 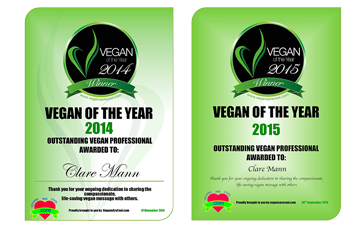 Clare Mann is a psychologist, author and passionate animal advocate and ethical vegan. She is applying her expertise and communication training to make it easier for vegans to share the philosophy of veganism by providing proven tools and techniques to have even the most difficult of vegan conversation. What is a vegan psychologist? Is it a person who only sees vegans? In practice, the term could apply to someone who was a vegan and also a psychologist or a psychologist who only worked with vegan clients. 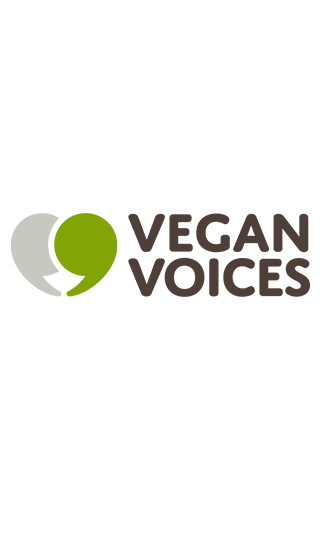 The training on Vegan Voices is provided by Clare Mann who is a psychologist who works with individuals to improve their self-worth and make communication their strength, whether they are vegan or non-vegan. Many vegans choose to access Clare’s skills because of the specific challenges vegans have with living in a non-vegan world. In the resources section, there is an article written by Clare Mann entitled ‘Should vegans be issued with a mental health warning?’ to highlight specifically why so many vegans prefer to access the services of a vegan psychologist rather than a non-vegan. Is there help on how to deal with the anguish of being a vegan? Vegan Voices is about becoming a powerful voice for veganism. This requires a person to be self-aware, manage the anguish of knowing what happens to animals for industrial purposes and then communicate the issues and solutions effectively. Managing your own emotions and channelling your distress into powerful action is part of being a powerful vegan voice. 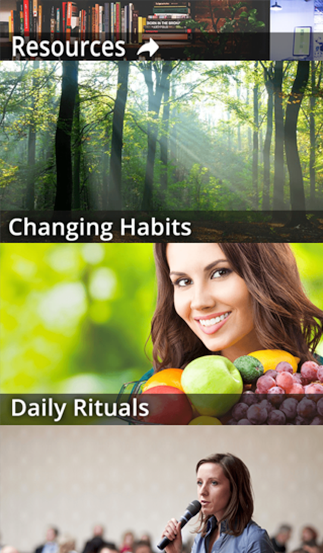 There are numerous videos that cover things like Creating New Habits and Dealing with Powerful Emotions. The Topic Self-Care in the Resources Section contains materials to help a person deal with their anguish or communicate it to non-vegans. What sort of topics does the app cover? When you download the app, you will be able to see the thirty topics of video training although you will not be able to access a video it has been unlocked on a specific day after initial download or you have paid a small fee to access the entire training. Topics relate to particular questions facing vegans e.g. How do I handle dinner invites when other people are eating meat? Won’t animals overrun the world if we don’t eat them? What do I say to people who deny animal cruelty? Is there any opportunity for the user to chat and add more details and chat with other people? These functions are not available on the app at present. We are improving the app all the time and these functions will be added at a later date. Can I re-watch the videos? Yes, once a day has been unlocked, you will be able to access all previous videos. Can I send the videos to someone else? You cannot forward any of the 30 training videos in the app but you can invite them to download the app and access the videos directly. You can easily forward the materials in the Resources Sections to other people via social media, email or text. What topics are covered in the Resources Section? There are numerous sections in this section, each containing links to videos, articles, books and films relevant to that section. A wide range of topics are covered under the following headings: Animal Social Justice, Health and Lifestyle, Environment, Self-Care and Celebrating Animals. Is this suitable for people who are on a plant based diet but not technically vegans whose life is built upon the non-use and exploitation of animals? Vegan Voices is for people who are vegan i.e. those whose lives are underpinned by the philosophy of the non-use and exploitation of animals. Individuals who are not vegan according to this definition may well find the app valuable, especially in terms of dealing with resistance of their lifestyle choices, but the person who will benefit most is the ethical vegan who wants to be the best voice for animals and the solution of veganism. No. The skills taught require a level of cognitive and social maturity although an adult vegan could learn the skills and then teach them to a child, using language appropriate to their ability and language use. For example, a vegan child is often asked why they don’t eat animals and there are tips given in the app to address these questions. However, an adult vegan would need to teach this to a child in a simpler language. It is anticipated that specialised training for children will be added as it becomes available. Are there recipes on this app? No, vegan voices provides training and resources to communicate veganism. Enter your details below for questions or suggestions about the Vegan Voices App. Please indicate if you want a direct reply.